A strong collective performance for the Cervélo team saw Roger Hammond take fourth, both his and Britain’s best Paris-Roubaix result since he took third in 2004. Following his seventh place in Flanders, Roubaix pulled down the curtain on Hammond’s best all-Classics campaign since his breakthrough year in 2004. But that was far from being all for Cervelo in this year’s Paris-Roubaix. With Thor Hushovd in second, and Hammond in fourth, the Swiss squad were easily the strongest team collectively, whilst Jeremy Hunt was one of the leading riders in the early break – proved by his 18th place at the finish, not to mention spearheading the race out of the notoriously difficult Arenberg Forest section. After Hunt had helped make the running early on, Hammond and Thor Hushovd waited for the crucial last 80 kilometres to show their hands. Having made two attacks before Cancellara went away, Hammond was then highly active in the chase group behind the Swiss rider and then attacked before the Carrefour D’Arbre again – which led to Hushovd breaking away with Flecha. 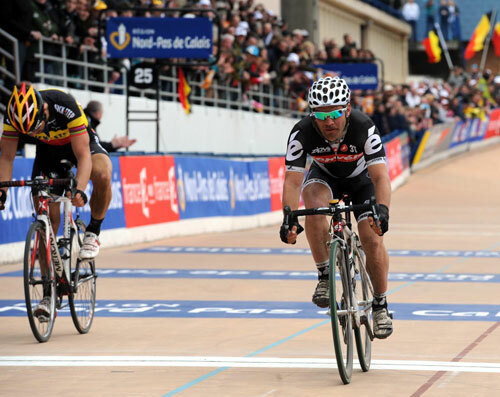 Whilst Cancellara was unbeatable, Cervelo’s Roubaix haul was capped by Hushovd in second and Hammond in fourth, outsprinting no less a figure than Tom Boonen in the velodrome. Still one of just three Britons to have finished in the top five of Paris-Roubaix, Hammond said seventh place in Flanders showed he knew he was in good shape, but he didn’t want to be over-confident like in 2009. “I knew the form was there like it was last year, but last year I came into Roubaix feeling cocky and I paid a really high price,” Hammond told Cycling Weekly. Hunt was also satisfied following an illness-plagued first half of the season in which he had only really shone in Kuurne-Brussels-Kuurne.